The series, Cover to Cover, was created in response to a selection of books in the Athenaeum Music & Arts Library’s collection. In Cover to Cover, Inattempt to create works that are simultaneously sympathetic to their sources, yet through my own emphasis and inflection become self-portraits. One common thread throughout the artist books of 1975 is a lack of interest in the art object. Artists like Allan Kaprow (who appears frequently in the Library’s collection), Hans Haacke, and Donald Celender were interested in mining ideas more than creating formal objects. 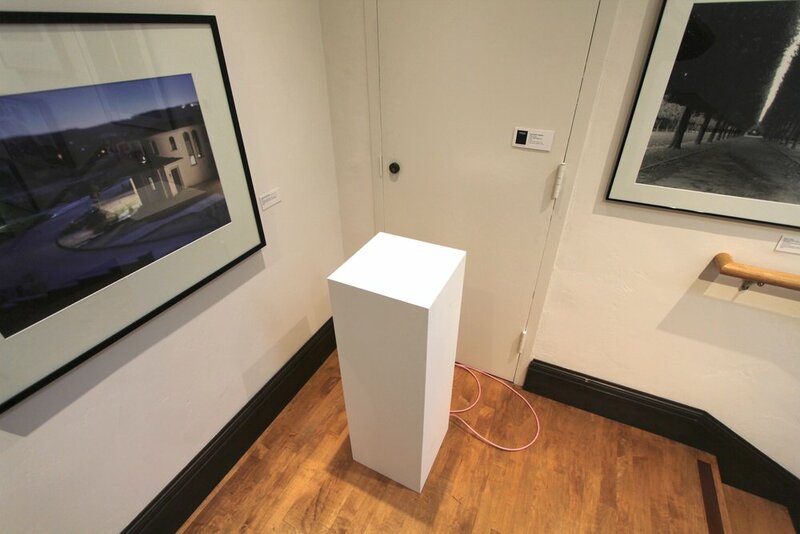 Much of the source materials pushed against the institutional frameworks of the arts, the work in Cover to Cover largely takes the form of “empty” pedestals, emphasizing the “missing” art object. Yet upon closer inspection and interaction the pedestals reveal themselves to be the art object. What does it mean to make objects in response to these books? How about doing that almost 40 years after their publication? I am curious about the status of objects in our age of Selfies and Social Networks. Finally, it is my hope that the installation within the Library further emphasizes the interdependency of the artist and the institution, while also giving the viewer a chance to see a space that may be familiar in an entirely new light. For the installation Cover to Cover 1-17, I "collected" the quotes using my smartphone camera, projected them onto panels, traced them, cut them out manually on a scroll saw, and finally attached them to background panels with a pin nailer. The arduous process was full of error and plenty of room for improvisation in the representation of the text/image. For example, all distortions from the mobile phone photography carried over into the finished product. In 1971 the video artist, Douglas Davis, created the first of his television pieces by placing a television, pointed at the wall and tuned to non-broadcast (static), on a pedestal a few inches from the wall. I found this piece, titled Images from the Present Tense, in Fragments for a New Art of the Seventies in the Athenaeum's artist book collection. The piece struck me the way that many Conceptual Art pieces do... that's so easy. The conceptual artist, Don Celender, was known for his humorous letter writing pieces. For example, he once wrote a letter to the director of the Cleveland Museum of Art, suggesting that the museum parachute 1,000 works of Asian art onto the state of Alabama. The Athenaeum has, in its collection, an artist book by Celender titled Museum Piece. The book is a collection of response to a letter that the artist wrote to museum staff around the world, asking for them to provide descriptions and photographs of their "loading docks or receiving areas." Celender collected the returned materials and published them as a book. Allan Kaprow's Rates of Exchange is a study in mediated exchanges, drawn out to their limits. The series of activities includes the source for this piece, reflecting, in which two participants each gaze into a mirror while tape recording scripted questions addressed to the other. For example: "(speaking partner's name) is your hair dirty". These questions would be read aloud over and over again until the tape ran out. The partner would do the same and then they would switch tapes and gaze into a mirror while listening. The activity is meant to create a strange friction by seemingly being a series of questions directed at the partner, while it would be an impressive feat of will to read the questions while looking into a mirror without becoming self-reflective.